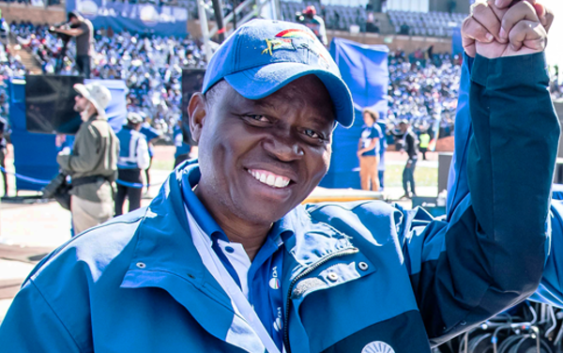 New Joburg mayor, Herman Mashaba, says the time of residents staring at expensive billboards or listening to radio adverts about a ‘World Class African City’ while they do not have basic services, has come to an end. Delivering his inaugural speech, after 22 days in office, Mashaba said that the time for campaigning and politicking is over. “We face great challenges that no party can confront on its own. Now is the time for all of us to roll up our sleeves and get working together,” he said. “Those found guilty of corruption and fraud will go directly to jail,” the mayor said, highlighting the fact that there was over R5 billion in unauthorised, irregular, fruitless and wasteful expenditure over the last administration’s term in office. “This will simply not be tolerated under the new administration and any case of wrongdoing will be exposed and punished,” Mashaba said. “I also intend seeing the tender adjudication process being opened to the public and media so as to prevent wrongdoing. This will also encourage the growth and development of small businesses, who in the past never stood a chance, because they were not part of the politically connected elite,” Mashaba said. “The blatant abuse of residents’ money on excessive advertising, lavish parties and self-serving promotion has come to an end,” he said. Mashaba said that in the last two years, the political leadership of the City had authorized over R156 million in marketing and advertising. R56 million of which was spent to communicate the End of Term Performance of the outgoing administration, conveniently just before the elections. “You should be ashamed of yourselves. It is a disgrace that our residents have had to endure your shameless self promotion of a ‘World Class African City’ while living with your less-than-world-class performance,” Mashaba said. The businessman-turned-politician asked the people of Johannesburg for patience. “The truth is that there are no short cuts, there are few quick fixes and no silver-bullets. It is going to take time to correct the many years of mismanagement and decay that has resulted in the failures of our City,” he said. Mashaba said that the biggest challenge facing Joburg is the soaring unemployment confronting over 800,000 people. “Job creation will be the number one priority of this new DA-led administration.Small businesses create jobs,” he said. Mashaba said that when he sat down with his team he was presented with a projected target of 2.5% economic growth in the City. “This is simply not good enough. Because to accept 2.5% economic growth would mean we accept that we will not make a dent in the number of unemployed people in our City. I cannot accept this,” he said. He said his newly appointed team will conduct a skills audit of the City of Joburg’s employees to ensure that all are properly qualified for the roles they are in. “Gone are the days of cadre deployment and the appointment of friends and family. The days of requiring a political party’s membership card to get an EPWP job are over,” Mashaba said. He said that that the majority of the city’s budget will be directed to poor communities.